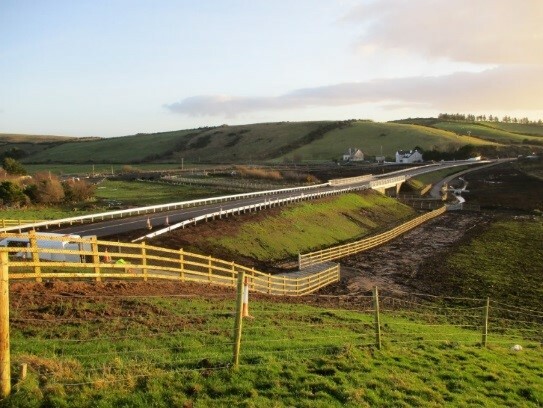 The scheme involved the construction of an NRA Type 3 single carriageway road (6m carriageway with a 0.5m hard strip and verges of approximately 2m to 3m) for a distance of 2km, with approximately 650m of the scheme constructed off-line. 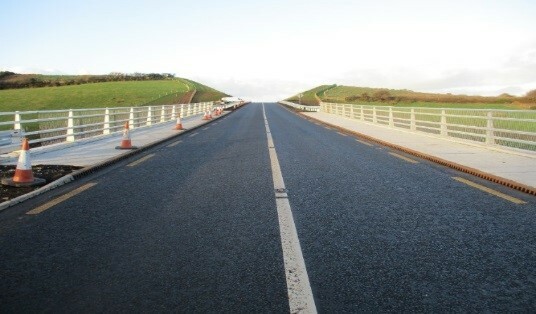 Cycleway 2.5m wide alongside the improved N59 in sections and of 17,545m2 pavement. Two new river bridges and widening one existing river bridge.240,000 ton imported rock. 3.4m x 20m box culvert. 30,000m3 of excavation in swamps, marshes and deep bog with depths up to 10m. The contract had 175,000m3 total excavation, with 50,000m3 being either re-used onsite or processed from U1 to Class 2 for re-use in embankments. 1,200m2 random rubble & ashlar stonework. Installation of road signs, road markings & studs, safety barrier and parapets. With an AADT of 4,300 on the route, traffic management was designed and implemented by Ward & Burke.